The introduction by Martin Brasier puts the question into a historical context and discusses how the first pioneers (which included Charles Darwin) both helped and hindered the search for early life. Crucially, there is discussion on the formation of stromatolites and how our understanding of the “cyanosphere” has changed with the development of high-resolution analytical techniques and experimental studies into the abiogenic nature of some apparently biogenic structures. Brasier illustrates how “self-organising structures” can develop a wide-range of morphologies and shows that biological structures occupy a restricted area of “morphospace”. In a theme echoed in the following chapters, he warns that many so-called Archean microfossils should be viewed with caution until non-biological processes for their formation can be disproved beyond doubt. Wacey chooses to tackle this in the first part of his book by explaining the Archean rock record and what signs of life might reasonably be expected to occur in rocks of this age. Lavishly illustrated, and supported by lists of recommended reading, Wacey explains how scientists have sought to establish the criteria for life in the Earth’s oldest rocks and the importance of proving both the age and biogenicity of putative biological structures. The reader is introduced to the geology of the Archean cratons in a useful overview, followed by a summary of the techniques used to investigate these rocks. Emphasis is placed on the importance of the traditional geological methods of mapping and petrography to ensure that the context of any potential biological structure is well understood. The pros and cons of analytical techniques, such as transmission electron microscopy and secondary ion mass spectrometry, are also covered and underline the importance of good mapping prior to the use of any destructive technique as “there is no going back to check!”. This section also includes a good introduction to the use of isotopes in the search for early life, as well as giving a classification of microbial metabolism and a summary of metabolic pathways. The second part of the book is described as “an atlas of claims for early Archean life” and sets out in detail the current evidence for life in the Archean. Key information about each claim is presented in an easy to read summary and includes photographs and the interpretation presented in the scientific literature. Based on the author’s personal opinion, a modified “traffic light” system is used to examine each claim; Wacey’s first green light (a strong candidate for life) is given to the presence of possible hyperthermophilic bacteria in the Hoogenoeg Formation, Barberton, dated at ~3,450 Ma. 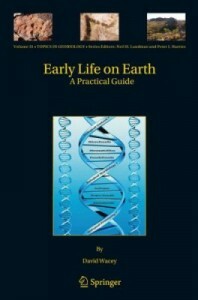 Suitable for graduate students and early career researchers, this book provides a useful introduction to the current understanding of life on the early Earth. The excellent images and use of bullet points and tables to encapsulate key information make this book highly readable, whilst providing suggestions for additional reading for those who want (or need) to know more. The text is clear and well-written but not all the internal cross-referencing is correct; missing scale bars and typographic errors suggest that the book would have benefited from more careful editing, although this does not detract significantly from its overall content. In his introduction, Brasier states that “these interesting candidate structures” for the earliest evidence of life on Earth “await critical scrutiny by the next generation of explorers”. This book is thought-provoking and challenges the notion that “consistent with” is a phrase that scientists should be willing to accept within the rigour of scientific debate. As the search for life continues elsewhere in the Solar System, the need for agreement on what constitutes life on Earth has never been more timely.